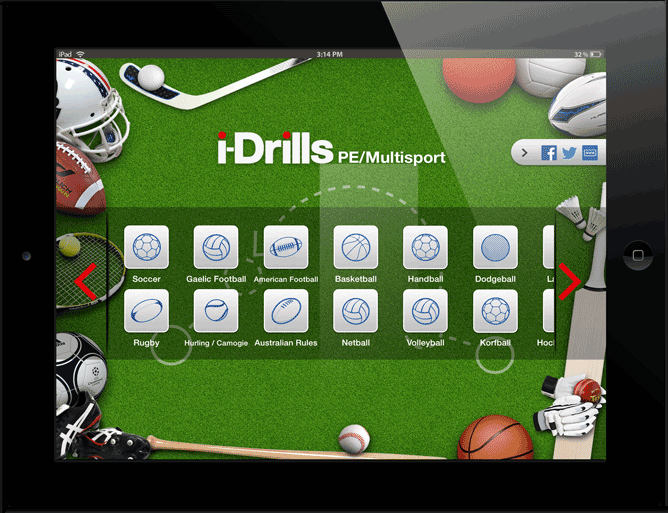 Now available in the AppStore, i-Drills PE & MultiSport is the perfect app to allow teachers and MultiSports coaches to get creative with their lesson and session planning! 20 Sports all in one app. Create, Store, Plan and Share practices with colleagues and CoachMates across the globe. Despite having been pencilled in for development a number of years ago, when we pressed the button on development, within 6 weeks we were up-and-running with out test version of i-Drills MultiSport and PhysEd app. A fantastic app for those who work in a multi-sport environment or within education. We have 20 sports available in the launch release of the app and they cover the vast majority of sports that users may want to use. Of course if there are any that we have omitted which there is a body of support for, we will of course look to add them in in a later release. The sports available at launch have 1 specific sports canvas and a selection of ‘generic’ drill/practice planning canvasses. Each sport gets, more or less, its own equipment where relevant. Racquets in Badminton and Tennis, Sticks in Lacrosse and Hockey, Bats in Baseball, Softball and Rounders for example. The highly successful CoachMates and TransferMarket features that debuted on i-Drills Rugby and FA Coachs App have been included within this app and therefore opens the possibility of sharing content and lesson plans between coaches and teachers across the globe. Both of these features have been heavily used by soccer coaches who have enjoyed the ability to share both publicly and globally, as well as private and direct sharing with colleagues for collaborative sharing and creativity. Setting up your CoachMates account is simple and within seconds you can follow/support other coaches and begin to download shared content. Its a truly intuitive way to add inspiration to your work. Likewise you can share with others and offer them the opportunity to benefit from your ideas.